Low Cost airline EasyJet launched a new route from Paris Orly to Budapest in November 2008. 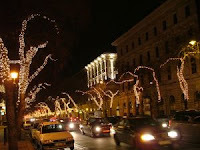 What can you see in Budapest in November? A colourful Christmas market, apart from many other attractions this city has. The Christmas Fair in Budapest, Hungary is a special celebration every year, but this year they will be celebrating their 10th anniversary, making the season's events even more special. The fair will be held on Vörösmarty, opening on November 21st and closing December 29th. The Christmas Fair's festive atmosphere is all due to the unique pavilions and exclusive products being sold. There are nearly 100 craft stands that offer goods, folk art and craft decorations, and special gifts as well. All of the items are also certified by the Association of Hungarian Folk Artists' panel of experts. For the visitors who wish to taste the traditional delights of the city, they can find it here by the city centre where there are freshly baked bread lángos that are made in a traditional clay oven, stands that sell caramelized pastries made by strudel and horn makers, friendly meat grills, and traditional country food made in clay ovens. Mulled wine is also a treat to enjoy while at the Christmas Fair, and after having some, visitors can go home with the special mug that they were served it in. Every year this special Christmas Fair Mug is given a new design, making it great to get for a collection. There is also always entertainment going on, with Hungarian folk music and dancing, classical music, concerts, and even programs for the kids. On the front windows of the Gerbaud House is the Advent Calendar, where 24 contemporary artists display their paintings. Also, everyday a new window is opened with a fanfare accompanying it.